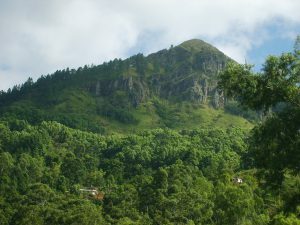 This is one of the two main mountain ranges exist in Badulla district. The other range is Namunukula. The closest town is Passara and the peak of the range can be accessed from Passara or Madulsima areas. The Sinhala name Lunugala means Salt Mountain. On the summit of the mountain there are many quarts which may be the salt like appears inherited to this mountain which caused its name. This is also a good choice for a hike. But there are not much primary natural forests exists in this mountain range. Most of the parts of the rage have been covered by Pine trees as a result of forest plantations. But the summits are barely bold without trees and covered with quartz.